PowerColor is best known as graphic card manufacturer, this year, they have introduced new product line sound cards. 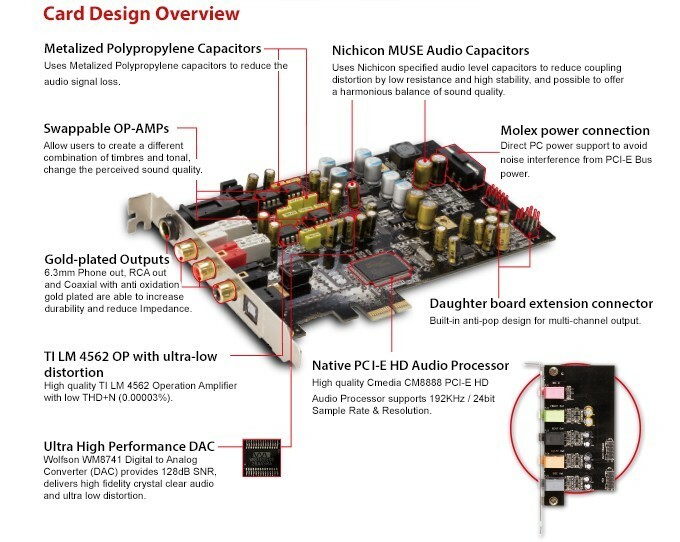 Devil HDX Sound Card is includes switchable OP-AMPs, high quality capacitors, a Cmedia CM8888 audio processor, and Wolfson WM8741 DAC. This configuration is capable of driving headphones with up to 600 Ohm impedance. The card has a quarter-inch headphone jack, two analog RCA jacks for stereo, an RCA SPDIF output, and an optical SPDIF output. The main card is covered in a full EMF shield. 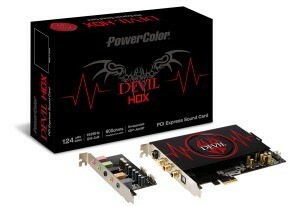 The PowerColor Devil HDX will lunch in few months with retail for $159 (₹1100 Indian Rupee). Xear™ SingFX for karaoke application.